I like handbags and generally purchase one per year. I carry it most of the time and rarely switch handbags to match my outfits. To take care of them, I clean my handbags with Cadillac Boot & Shoe Care. It was recommended to me by a Chanel salesperson, and she said this product is what they use to clean the handbags in the store. I’ve had great results with it. 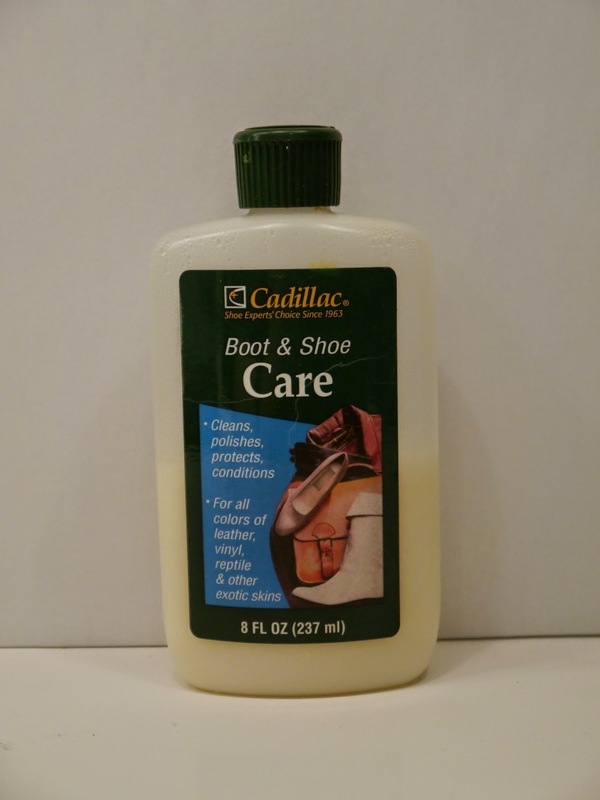 Though it looks like they’re changed the packaging, Cadillac Boot & Shoe Care can be purchased here. I realize it’s been a while since I’ve posted a movie review, but until this weekend, I hadn’t seen any movies I could recommend. 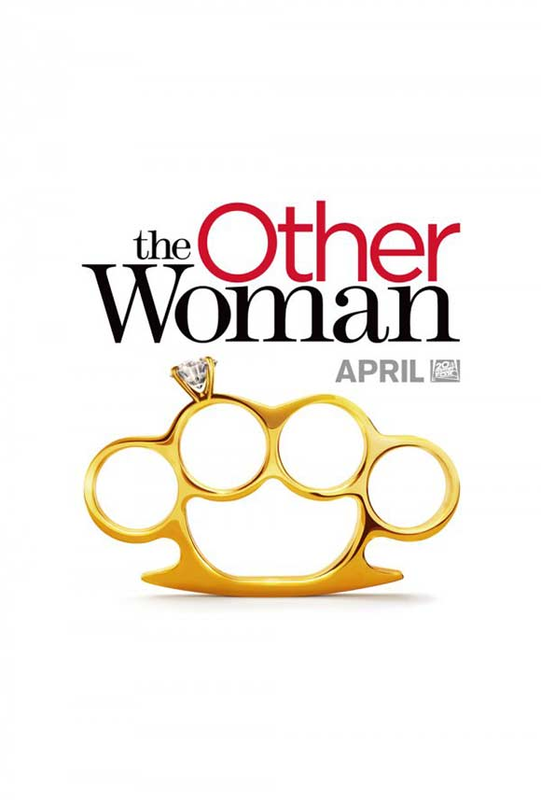 The Other Woman is an adult-themed light comedy worth seeing. After hard-nosed attorney Carly (Cameron Diaz) discovers her boyfriend, Mark, is married, she realizes she and his wife, Kate (Leslie Mann) have a lot in common, and the two begin an unlikely friendship. Upon discovering Mark has yet another girlfriend (Kate Upton), the three join forces to exact revenge on Mark. While The Other Woman hasn’t been a critics’ favorite, I thought it was entertaining and especially liked that the women worked together, instead of competed with one another. The movie also promotes women’s empowerment and acceptance of others. Seeing The Other Woman is a great way to spend an afternoon or evening! When we bought this house, we thought the only thing that needed to be done was building my closet (discussed in this post). Once we started living here, we realized we needed to make a few more tweaks. Though the previous owners installed black-out shades in the master bedroom windows, the glass door did not have any type of covering; our bedroom was pretty bright every morning, and I ended up awakening too early. 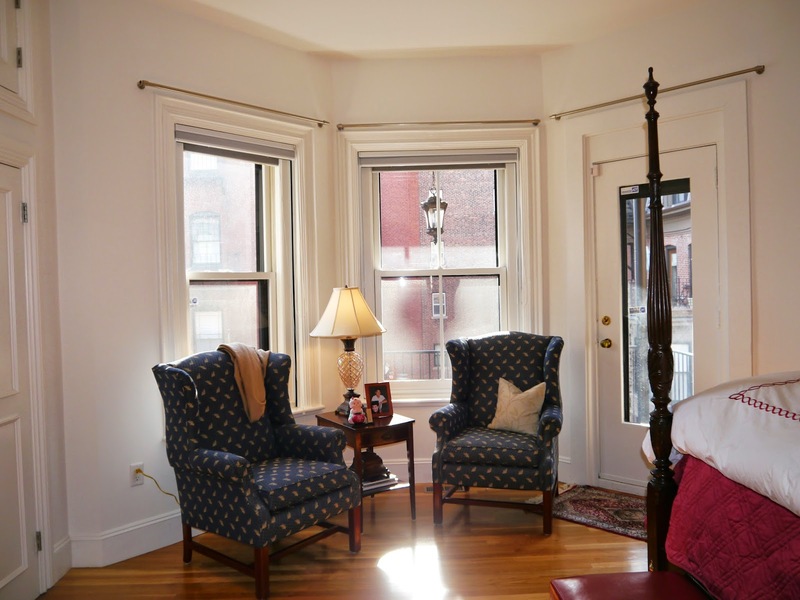 After living here a while, I also realized that when the shades were open, the wingback chairs were getting quite a bit of direct sunlight, and I worried about fading. Instead of buying a shade for the door, we invested in plantation shutters. What a great decision! Not only do they block out the early morning light, but the shutters also provide another layer of insulation AND protect the furniture when open, yet tilted. 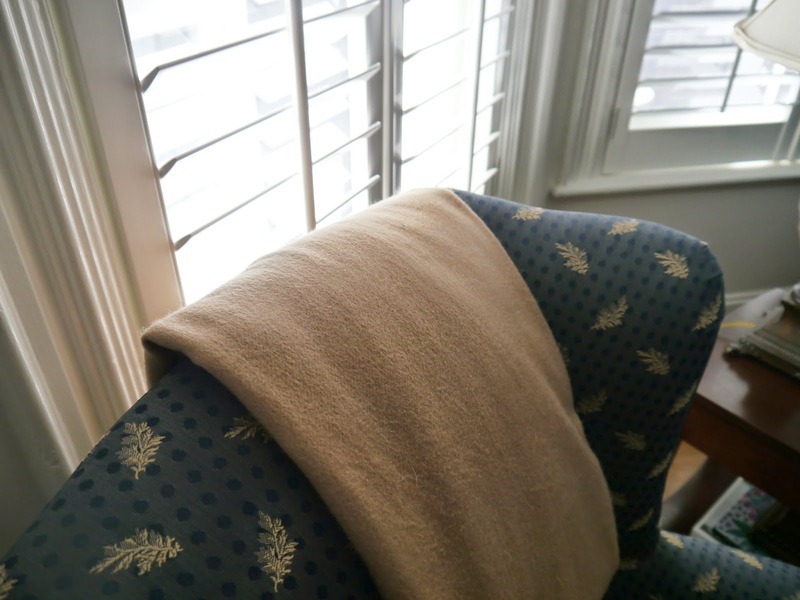 I like the shutters so much I also had them installed in the living and dining rooms. Sixteen year old cancer patient Hazel Lancaster and seventeen year old cancer survivor Augustus Waters meet in teen support group. They become fast friends, bonding over Hazel's favorite book, An Imperial Affliction. Together they have a grand adventure and friendship turns into love before their story is cut short by tragedy. 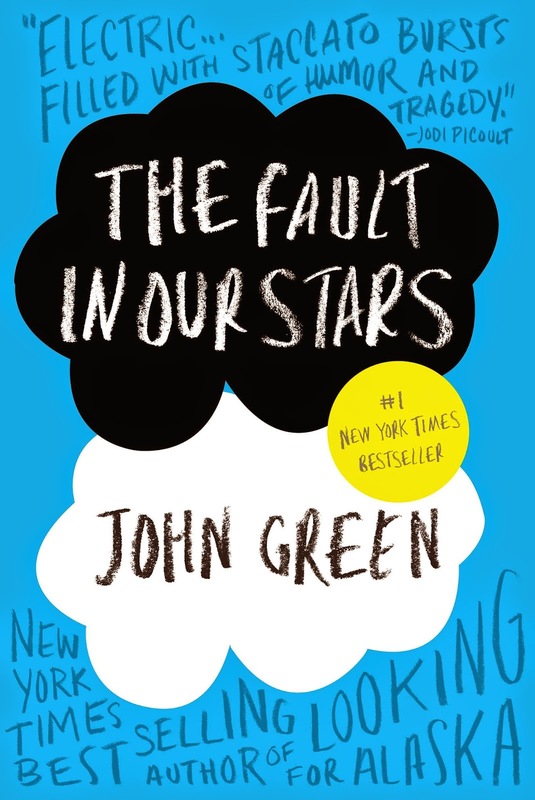 The Fault in out Stars is beautiful yet, heartbreaking. Young love between two characters who are wise beyond their years is a wondrous thing! Though I’m not a country music fan, I started watching Trisha Yearwood’s show on the Food Network. She’s not a classically trained chef, but makes some amazing comfort food. Kevin and Sean love macaroni and cheese, so I tried her recipe-the results are impressive and it has become a family favorite! When I was in Los Angeles a few weeks ago, I made this macaroni and cheese for Sean and his roommates. It was well liked and consumed pretty quickly. Because it’s easy to make, I think it will become one of Sean’s staples. When I lived in Southern California, I didn’t understand why people made such a big deal about the arrival of spring. Now that I live in the Northeast, I get it. It’s amazing how Boston comes alive when the weather warms up-shoppers bustling on Newbury Street, alfresco dining, students tossing a football on Commonwealth mall, grass sprouting up and the magnolia trees beginning to bloom. Now that the city is alive again, I feel the need to wear clothes that aren’t black or gray. Both AG and J. Crew seem to have changed their denim. I think both companies incorporated 4 way stretch, which makes way more comfortable than previous seasons’ denim. I wore the AG jeans on a plane flight to Los Angeles, and they were as cozy as a pair of leggings. When I was a girl, every Easter morning my brother and I awakened to find See's Candy Easter baskets in the living room. I continued the See's tradition with my family and always include Scotchmallow Eggs in Sean's Easter basket and give Kevin a box of Chocolate Butter Eggs. They're both wonderful candies, but the candy I most look forward to is the Jelly Bird Eggs. They're semi-soft jelly candies covered with non-pareils (sprinkles) that come in pink, yellow and green. 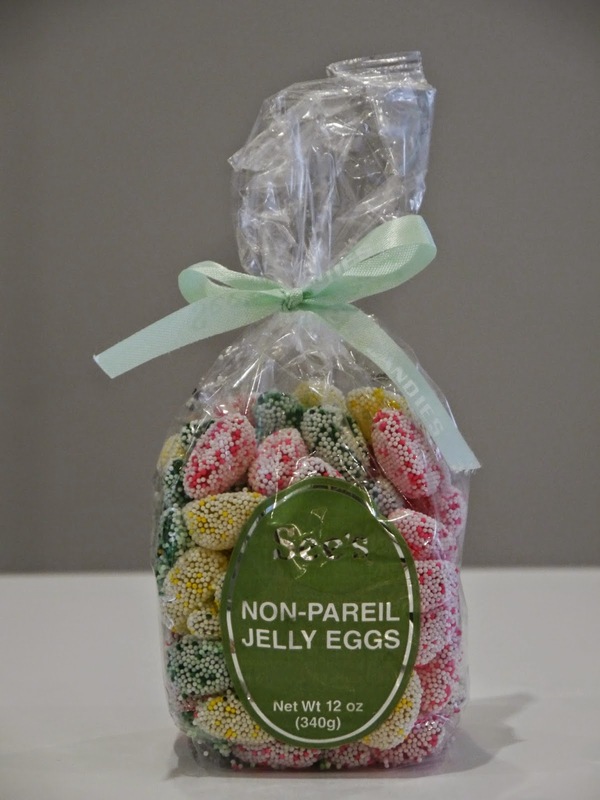 To make them last (since they're only available before Easter), I will only eat three per day, one of each color, savoring each one until the bag is gone. I LOVE potato chips! Because I don’t eat them as often as I’d like, they have to be exactly how I like them-thick, crispy, not oily and with no additional flavoring. These Cape Cod Waffle Cut Chips are so-o-o-o good-they’re my new favorite! Malcolm Gladwell is one of my favorite non-fiction authors because he manages to turn the mundane into fascinating reading. David and Goliath is a book about how some underdogs have become enormously successful due to their perceived weaknesses. He starts the book off with the story David and Goliath and explains why shepherd David was successful against the giant warrior. 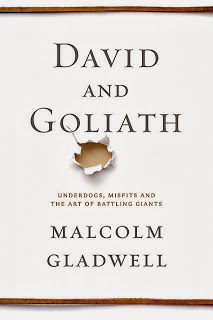 Gladwell believes being an underdog comes with some advantages-some of which are the ability to break traditions and rules, the motivation to try new things, and the necessity of developing other skills to make up for perceived deficiencies. Probably because my son is a college student, my favorite chapter in the book has to do with choosing colleges and why it's better to be a big fish in a little pond, rather than the other way around. If you have a child who is applying to or choosing a college soon, this chapter is a must-read! Even if you don't, this book is one not to miss! Probably because I come from a family of pack rats, I’m not a saver. I regularly go through our things and donate or discard items we no longer use. Every now and then, I regret my haste in culling. Such was the case with a julep cup I donated a few years ago. It contained an artificial flower arrangement, and when the flowers were dusty and tired, I got rid of them and donated the cup. Afterwards, I realized it would be a great vase for cut flowers. When I spotted this julep cup at Crate and Barrel, I immediately bought it. It’s perfect for this spring arrangement of hyacinths. 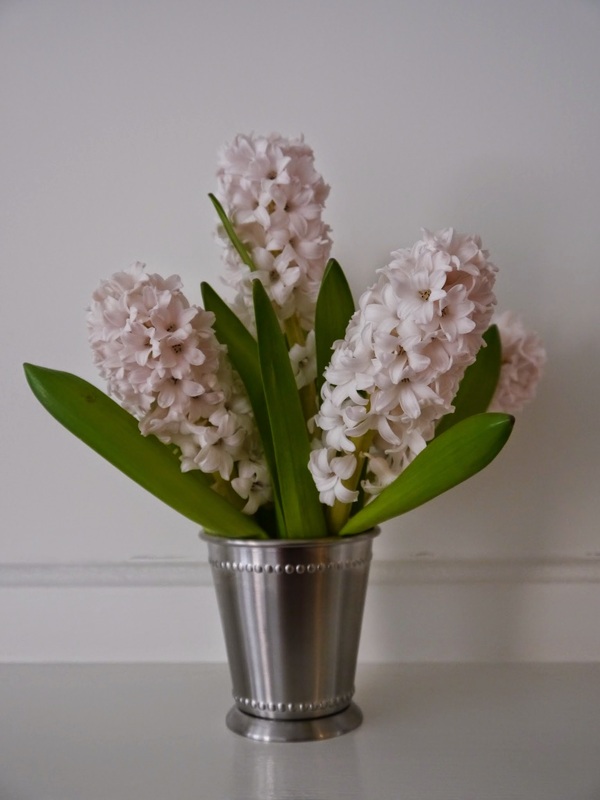 To make this arrangement, simply trim one bunch hyacinths to fit into the cup and distribute the leaves among the blooms. Since Sean moved away to college, our eating habits have drastically changed. In order to cut out our evening snack, we started eating earlier-pretty much as soon as Kevin comes home from work. On the weekends, we sometimes eat only two meals- breakfast and “lunner”-our term for a late lunch/early dinner. Another change we’ve made is eating lighter weekday dinners-often soup or stew when it’s cold and salad when it’s warm. This salad from Giada De Laurentiis is one of our favorites. When Sean lived with us, we often ate it with grilled chicken and whole wheat couscous. Now, it’s usually our entrée, and though it’s vegetarian, it’s completely satisfying. Place an oven rack in the center of the oven. Preheat the oven to 350ºF. Place the pine nuts in a dry skillet over medium heat. Toast for a few minutes until slightly browned. Remove from heat and set aside. Line a baking sheet with foil. Place the prosciutto in a single layer on the prepared baking sheet. Bake for 12 to 14 minutes until crispy. Drain on paper towels. Chop the prosciutto into 1/4-inch pieces. Preheat a grill or grill pan. In a medium bowl, toss together the asparagus and 2 teaspoons olive oil. Season with salt and pepper. Grill for 2 to 3 minutes each side until crisp-tender. Arrange the asparagus on a platter. Spoon the melon and Burrata cheese on top of the asparagus. Drizzle with vinaigrette. 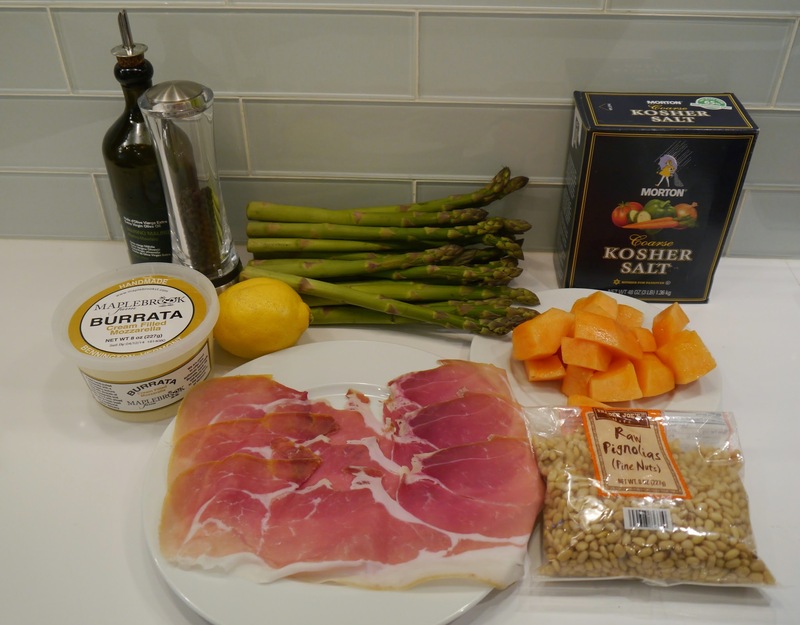 Sprinkle the prosciutto and pine nuts on top and serve. I’m so excited. Our friends M & K are coming this weekend for a visit; they’re our first houseguests in this home. Their visit benefits me in two ways-Not only do we get to spend time with our good friends, but their visit also gave me the impetus to look at the house with fresh eyes and tidy it up a bit. Set out a candy bowl and baked Homemade Cheez-it Crackers and cookies since we all like to snack. Washed the coasters-something I’ve never done, but have to admit they look a lot better. I admit the last two tasks are a bit over-the-top, but I’m glad I did them and excited our home is “guest ready.” What do you do to prepare for houseguests? Candy Bowls are always awesome! Cleaning the coasters made them look so pretty! I first tasted Key Lime Pie in my twenties while on a business trip to Cape Canaveral, Florida. Though I was a much pickier eater at the time, I immediately liked it. Similar to a lemon pie, but less sharp and creamier, what’s not to like? This recipe is very simple-it’s probably one of the quickest desserts I make. Instead of making a graham cracker crust, I buy one. I also use bottled key lime juice so the pie can be eaten year-round. Preheat oven to 325˚F. 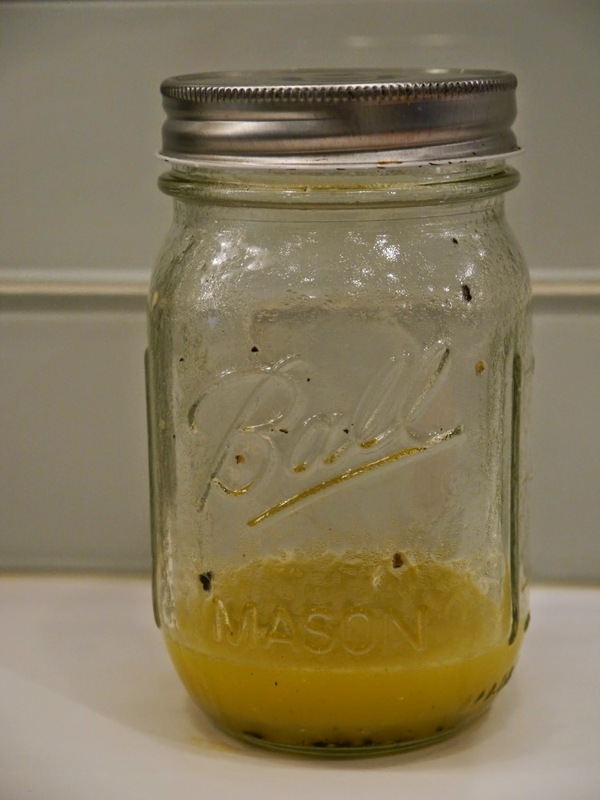 Whisk sweetened condensed milk with the egg yolks. Stir in whipping cream and lime juice. Add 1-1/2 teaspoons lime zest. Pour into prepared graham cracker crust and bake for 15 to 20 minutes. Top with sweetened whipped cream and a little lime zest.